I don’t know if you’ve had this happen too, but somehow my friends and I are always in the wrong place at the wrong time when we run out of diapers. I made something that has kept our car AND our diaper bag stocked with everything we need for our baby and my older kids too. Inside: How to get an instant $10 off when you buy 2 Pampers products at Sam’s Club. I felt bad for my friend who was stuck without a diaper. But, if I’m being honest, this happens to me too. See, I’m knee deep in a book called, “Getting Things Done: The Art of Stress-Free Productivity,” by David Allen and I’ve realized that I was never taught a good system for organizing “all the things” in my life. So, “things” get lost in the cracks like remembering my diaper bag, remembering to pay that bill, or remembering to grab my coffee out of the microwave. We have SO many things to remember, friend. Which is why my husband and I have worked really hard on building a system in our house. It started with our command center, but we’re also making an effort to write things down. Not in a random way, like on a post-it or a piece of paper (*ahem* my favorite ways to write things down), but in a quick way that takes that “thing” off of our mental to-do list and puts it into action. Our stress does NOT come from having too much to do (although let’s face it, I know you’re busy like me…), but we add to our stress because we have lots of little-incomplete to-do lists in our heads of things that we never finish. Like restocking the diapers in the diaper bag. But, we’ve got to do something about it. 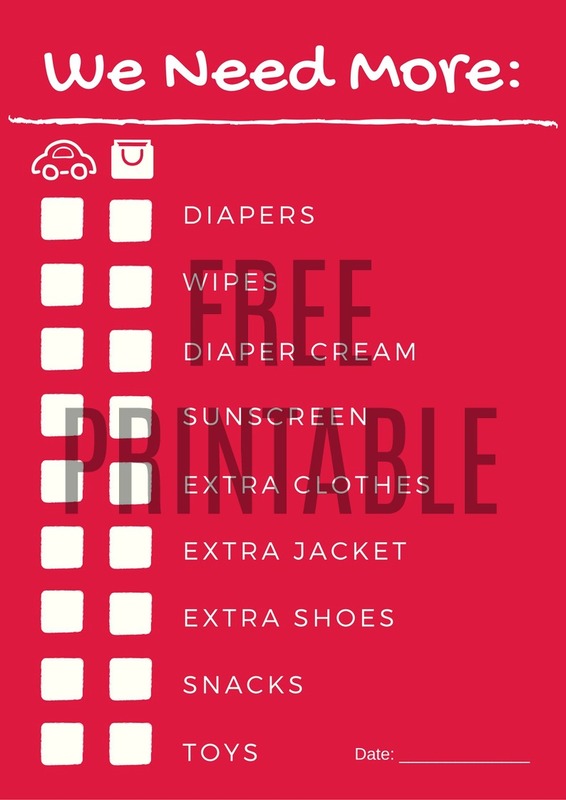 So, I made this easy printable that my husband and I that we store in our car and in our diaper bag. Using this printable is one small step that you can do right now to start taking things off your mental to-do list and to start taking action. I promise it’s going to feel awesome. First and foremost, you’ve got to have things on hand like diapers. One way to keep your 2018 on track is to make sure you’re always stocked up on essentials. Right now, you can get an instant $10 off when you buy 2 Pampers diapers or wipes at Sam’s Club, making it easy to keep your babies comfortable and dry. Oh, I love a good deal! Hurray, this deal ends on January 28th! 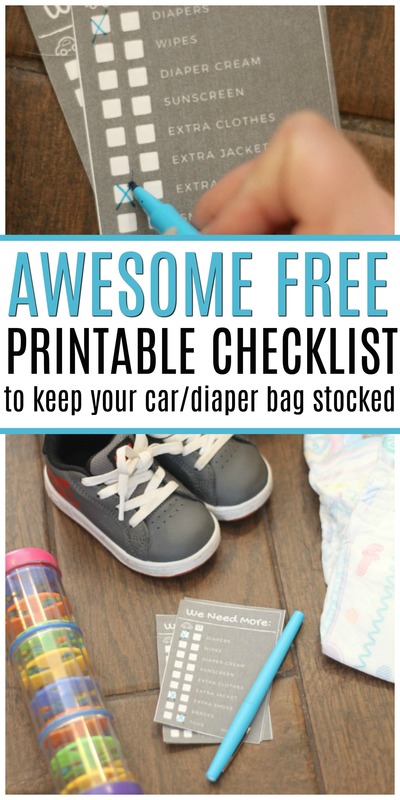 Print off our restocking printable checklist for the car and diaper bag. When you are low on supplies, check off what you need and take it to your command center or where you know you’ll see it. Take supplies out the NEXT time that you walk out to the car or you go to the diaper bag. We often try to get things done all at once. Keep your note handy where you’ll see it and restock your car the next time you walk out there. It’s so much more efficient to do it that way! You’ll have supplies on hand (like extra Pampers diapers, wipes, etc.) And, you’ll be writing things down so you can get them done easily. Sounds, fabulous right? It is possible. Just print off the checklist. And, start using it regularly. Because I don’t want you stuck at the wrong time in the wrong place without any diapers, friend. Remember, the deal on Pamper’s diapers and wipes ends on January 28th! You can get Pamper’s Swaddlers, Pamper’s Cruisers, or Sensitive Wipes all at Sam’s Club.